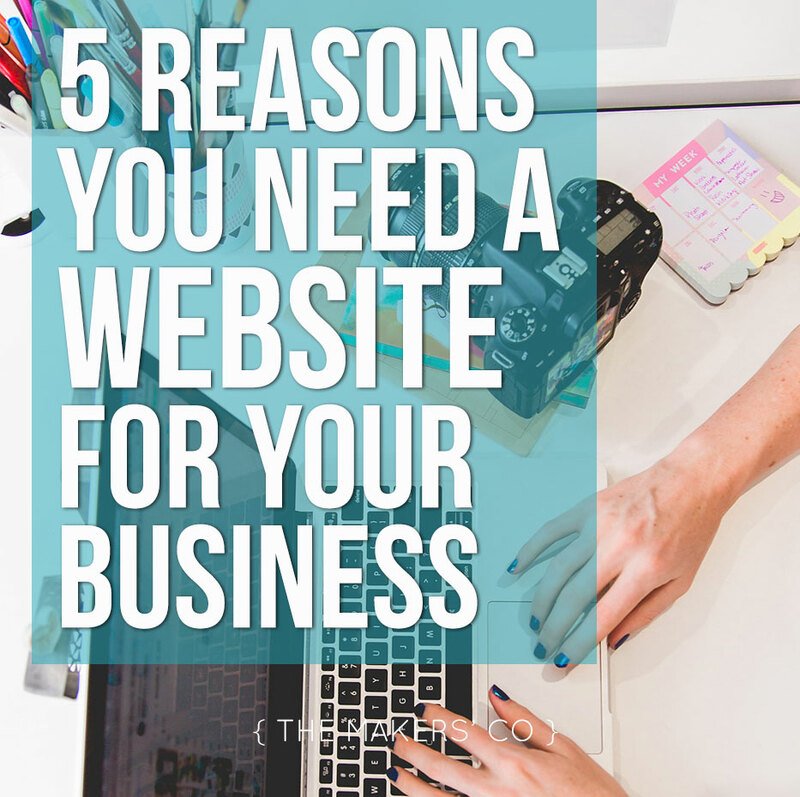 If you’re wondering whether or not you really need a website for your business, I’m going to go ahead and list the top 5 reasons why I think you MUST have your own website to succeed in small business. Access to social media as a selling tool has made it easier than ever to start a small business – in the last 20 years, female operated businesses have increased by a whopping 46%, and in 2014 one in four start-ups were run by a woman (which is still really low, but that’s an issue to tackle on another day). The number of women (and especially mums) starting their own businesses is climbing at a rapid pace (yay! ), and starting out by selling products or services on Instagram or Facebook has become second nature to most. So do you really need a website for your business these days? The short answer is yes. Yes you do. If you need a little more convincing, here’s my top 5 reasons you MUST have a website for your business, outlined below. Your brand is not just your pretty logo and the colour and fonts you use, it also includes your messaging, the promise you’re giving your customers, the experience a customer has every time they see or hear about your business, the story and history of your business, why you’re doing what you do and how it’s going to help your customer or add value to their lives… That is a LOT to cover in one little Instagram bio! Your website becomes the home of your brand, where you can tell that story and give that specific experience you want your customers to have when they interact with your business. The visual elements of your brand are also so important in crafting that experience your customers have with your business. Facebook have their own branding and colours (blue and white), as does Etsy (orange), as does twitter (light blue). There is only so much you can do on a Facebook cover image and tiny profile photo to convey your own messaging through colours and imagery, and it’s not really enough to solidify that message in your customers minds. Those social media graphics, along with things like your business cards, product labelling, and email graphics should all come from your visual branding that is displayed as a cohesive story on your website. Did you know that until recently, if someone wanted to purchase an item from your etsy shop, they would have to create their own buying account on Etsy? This is a barrier to purchase, and one you have no say in, depending on the platform you are using to sell your products or services. By having your products or services available for purchase directly through your own website, you have complete control over the sales process and can guide customers through making a purchase in a specific way to enhance their experience with your brand. Often when selling products using an online marketplace as your platform, it is very easy for customers to click away from your particular store and find what they are looking for on someone else’s shop (again we can use Etsy as an example here). It’s like having a small shelf with your items on it in a big store, and when something catches their eye on the next shelf over, they move away from your products and may not remember or care to come back. When you sell on your own website however, it is a closed environment (like having all your own items in your own shop that a customer has walked into), and the only way they are leaving is by choosing to walk out the door once they have finished looking, or making a purchase. A lot of selling platforms take fees for the privilege of selling through them (much like selling in a shop on consignment). These are usually either a percentage of the sale, or more likely a regular monthly fee, which may include hosting your shop also. 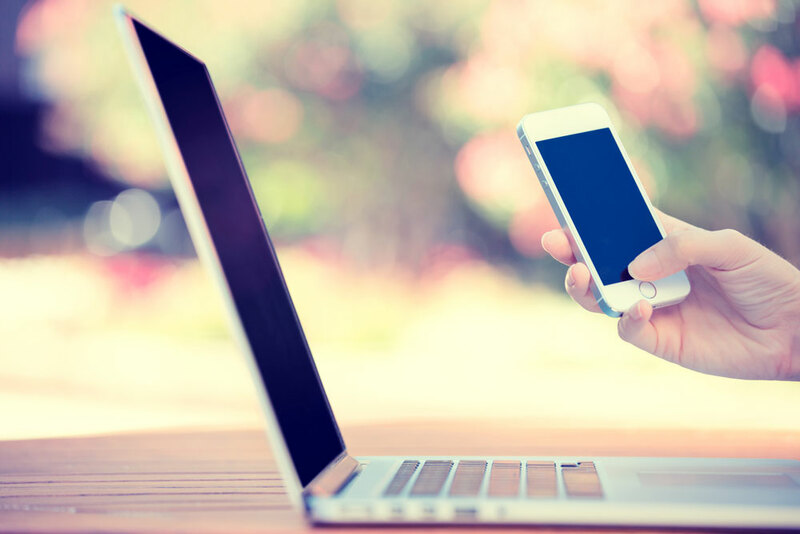 Sometimes these options can look like a good option because they’re an “all-in-one” solution, but often the solution is actually very restrictive and difficult to customise in terms of customer experience and functionality. Having your own website gives you complete control with no extra costs. Once you have your domain name registered and hosting account setup, you could potentially run your website with zero extra costs to you, and it’s definitely not as difficult as you may think! 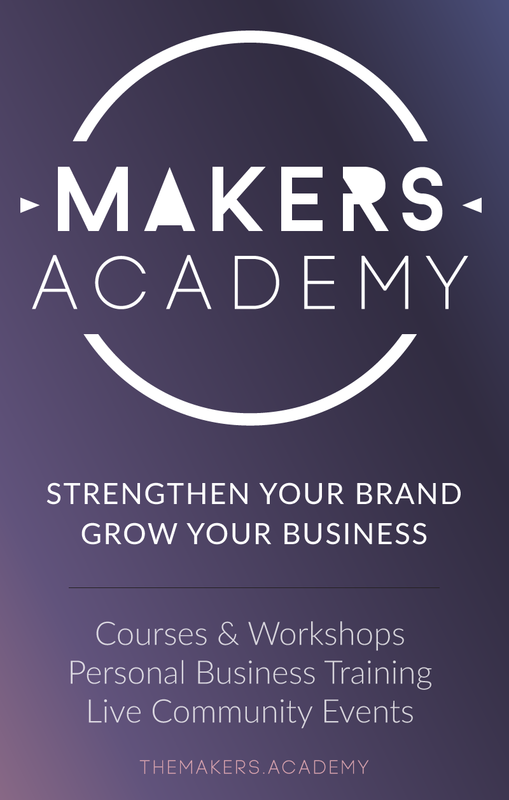 CLICK HERE to register for my online class where I teach you exactly how to create your very own website, step-by-step with image and video instructions. 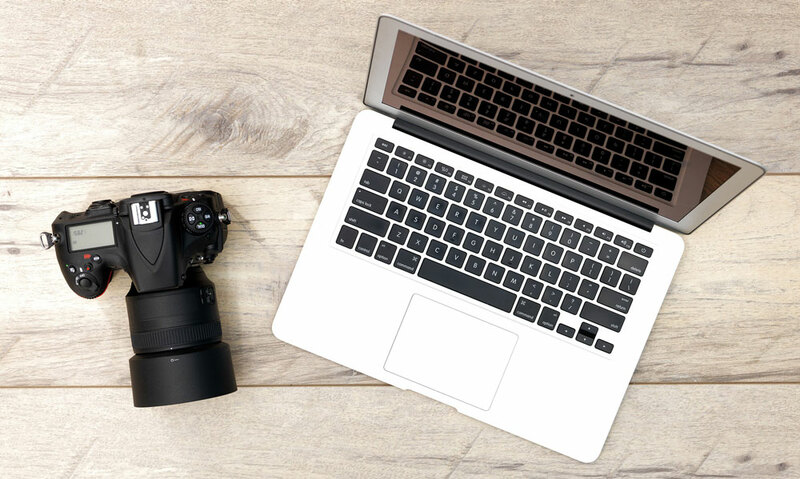 Firstly your website gives you an opportunity to showcase your products and services and include more information about each product – for example how it was made, or information about a particular range or style. You can include as many images as you like at no extra cost, and set the image sizes to whatever is suitable for you customers to be able to view every detail (especially important if selling physical products). Sally is looking for a wall clock in the shape of a deer for her kids room. She googles “deer wall clock” and two websites come up for businesses in her local area, yours is one of them. She see’s the clocks, loves them, the price is the same for each business. She heads to the about page of both websites to find out more about where she is purchasing from. You about page says you are located in Australia, you make your clocks by hand and you’re a small family business, but you don’t include your name or any photos of yourself. The other business however states they make the clocks by hand, has a photo of herself with her family and goes into detail about why she started the business, that she loves being able to spend time with her kids because of the support she receives from her customers she looks forward to meeting more people through her business. Sally has kids too, which she likes spending time with. She immediately feels an affinity with your competitor and purchases from them, you lose the sale. Having your own website allows you to tell your story without a word limit, and in a way that is true to your brand. You can add as many images as you like, and really start to form a relationship with your potential customers. 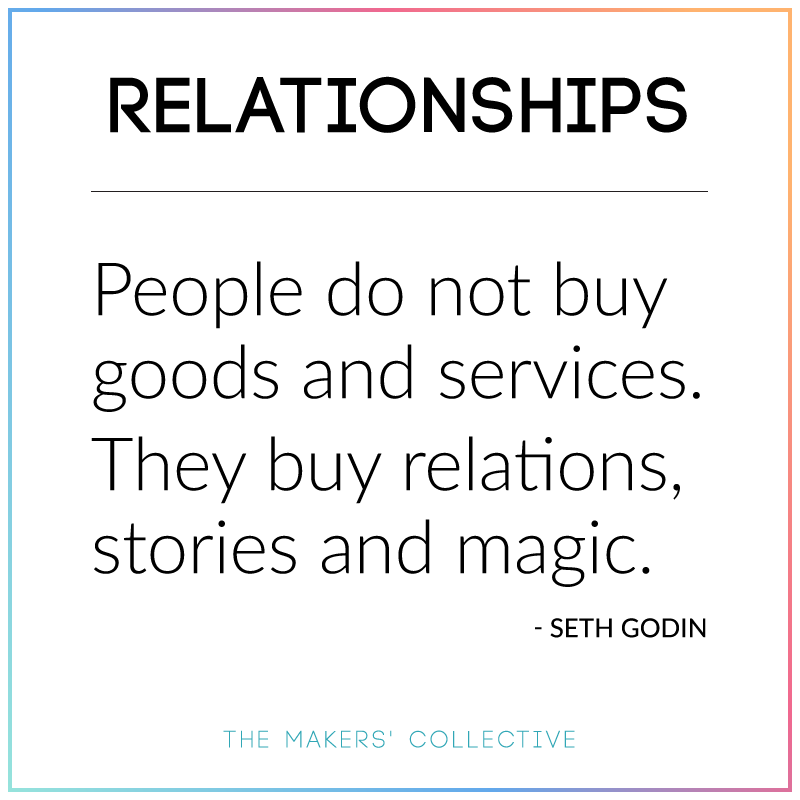 If you want to go a step further, you can expand and deepen those relationships with your customers via a blog. You can post about your process, current orders you’re working on, a little snippet here and there of your life (it’s important to keep it mostly business related though) and ask questions of your audience, or get them to give input on new designs or products. Asking a question and replying to any comments you receive will really improve your relations with your customers and help to boost engagement across all social media platforms, as your audience will feel like they really know you and be more inclined to comment on your regular social posts. You can also run giveaways and other competitions easily on your own website, without having to worry about all the extra hoops Instagram and Facebook like to make you jump through (do be sure you are abiding by your state or territory laws for runnings giveaways on your website though! Here’s a handy guide). When selling online, nothing is more important than the ability to be found, and not showing up in search engines is the fastest way to lose credibility with your customers. Having your own website gives you far greater opportunities to optimise that website to show up in search engines (Search Engine Optimisation aka SEO). Other selling platforms give you some options for inserting keywords and the like, but nothing compared to having full-control over your text, image titles and alt tags, meta description, keywords, page titles and urls, and more. By using key-word rich text in your product descriptions and also in your regular blog posts, you will improve your SEO, which in turn helps you get found on search engines like google. Why is this important? When you have the option to just post a tweet or a photo to Instagram at any time for free, why does it matter so much to show up in Google? Because you want to be found when people are ready to buy. You can post as many times as you like to facebook every day, but if the people that are seeing your posts aren’t ready to buy, you won’t make a sale from it. So when are people ready to buy? When they’ve made the step to search on the internet for the product or service! Sally is googling “deer wall clock” because she wants to buy it today for her kids room. If you don’t show up in that search, you’re not going to make the sale. 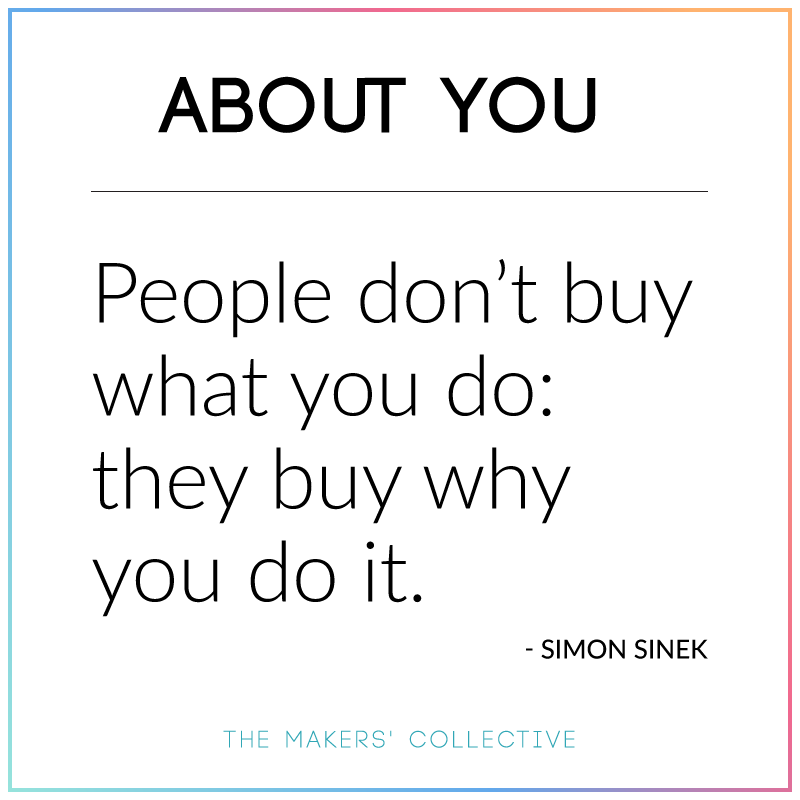 This is probably one of the most important points for why you need to have a website for your business. You do not own your facebook page. You do not own your instagram page. You do not own your Etsy account. At any time, these platforms can change their permissions, change their terms of service, close your account or close down completely themselves. If you build your Instagram following to 50k and your account gets hacked, or you accidentally break a rule and your account gets shut down, how are you going to reach your customers? You do own your website. You do own your mailing list. Your customer database should exist separately from these social media and selling platforms, and you should have a way of contacting your customers through email, not just private message. Having your own website allows you to be in control of these things, and it allows you to collect the contact details (ie name and email address) of potential customers also, to add to your mailing list which is an invaluable marketing tool and so important to get started on as soon as possible. I have some exciting news for you, fellow ice vovo lovers – a website does NOT need to cost an arm and a leg to get up and running. Honestly, domain registration and hosting can be as little as $5 per month, and if you use a platform like WordPress with WooCommerce as your store, the software and plugin cost is zilch. 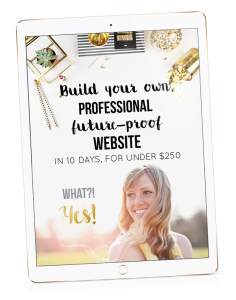 My Build Your Own Website course goes through step-by-freaking-step EXACTLY what you need to do to get your professional, future-proof ecommerce website up and running, fast and super cheap. And the best part is, my course is FREE!